As I mentioned recently, I taught the last two weeks of my colleague’s differential equations course. The topic was discrete dynamical systems. I posted links to a few Geogebra applets that I made, namely, applets for illustrating one-dimensional dynamical systems and an applet to generate cobweb plots for the logistic map. In class we talked about families of discrete dynamical systems: functions in which is a parameter. In particular we focused on bifurcations. From our point of view we say that the family has a bifurcation at a parameter value if the number or nature (attracting or repelling) of periodic orbits changes as passes through . We focused on the following types of bifurcations. Tangent bifurcation. A pair of fixed points are born—one attracting and one repelling. Pitchfork bifurcation. A single attracting (or repelling) fixed point splits into three fixed points, one repelling (attracting) and two attracting (repelling). Period doubling bifurcation. An attracting period orbit becomes repelling and gives birth to an attracting period orbit. These period doubling bifurcations happen one after another, so we get attracting periodic orbits of period , then , then , then ,.. etc. This is called a period doubling cascade. 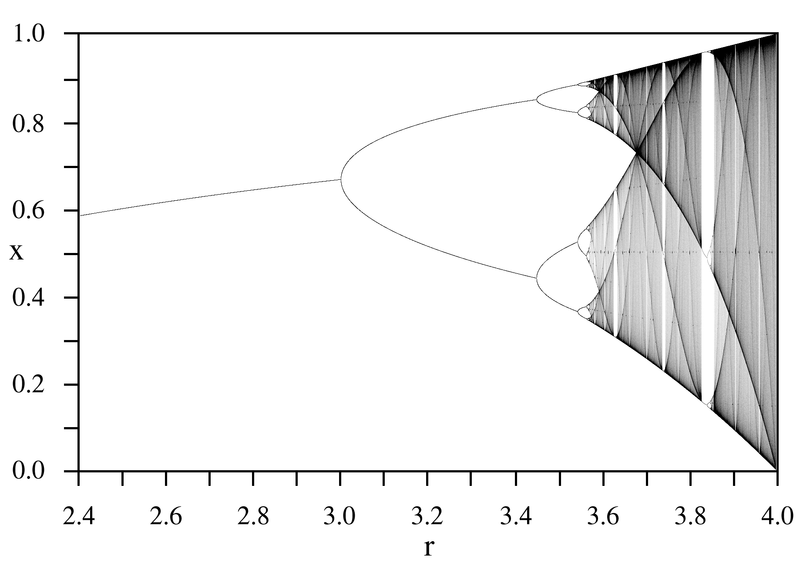 Below is a bifurcation diagram for the logistic map (thanks to Wikipedia), which you can click to enlarge. The vertical axis is the interval (the phase space) and the horizontal axis is the parameter, which we call , but is labeled . The plot is generated by iterating the dynamical system 100,000 times (with seed ) for each parameter value, but skipping the first 1,000 iterates. This gives us a way to see the long-term behavior, such as movement toward an attracting periodic orbit or chaotic motion. As I mentioned above, in each case these periodic orbits are attracting, that’s why we can see them. However, there is much more going on in these dynamical systems. For example, consider the logistic map with . There is an attracting period 3 orbit. As I explained in my earlier post about Sharkovsky’s Theorem, the existence of a period 3 oribit implies that there are periodic orbits of every period! By the way, it was neat to see two follow-up posts to my dynamical systems posts from other bloggers: Dan MacKinnon at mathrecreation wrote a curious population model and Mike Croucher at Walking Randomly wrote Using SAGE to investigate the discrete logistic equation. Very nice set of web diagrams with Geogebra. Thanks. M is a function of x, Eand I are constants. I had hoped solveode would work but am uncertain how. Sorry, I don’t. I haven’t used GeoGebra to solve any DE’s. Their help forums are pretty good. You could ask there.